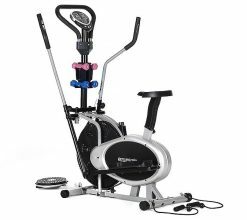 Your own quality home gym… A revolution in home gym equipment – have an elliptical trainer and an exercise bike for the price of one. 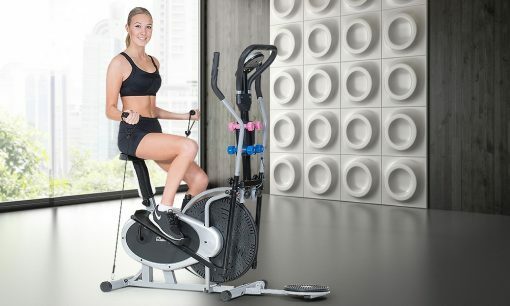 Switch in 30 seconds: Getting bored with one exercise or need to target and tone different muscle groups? 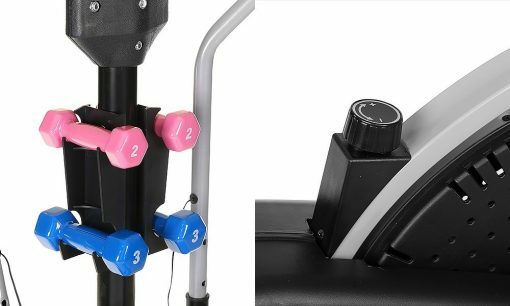 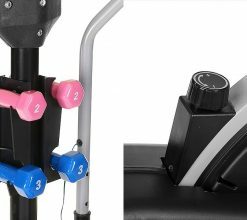 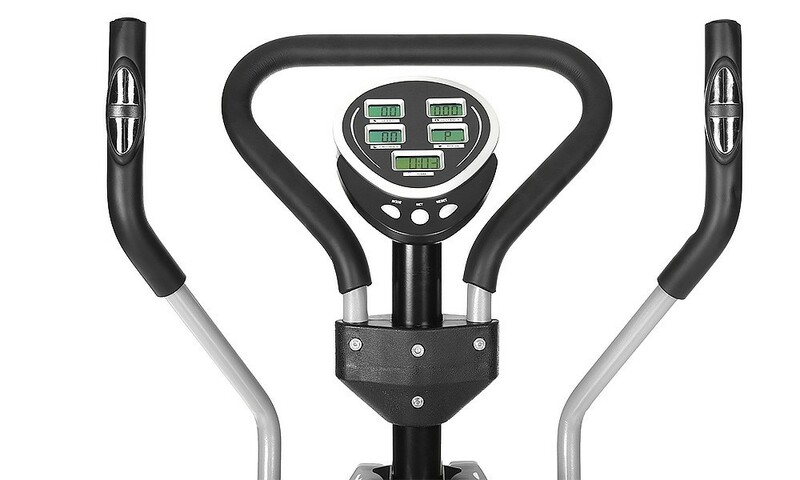 In just 30 seconds you can switch the handles between stationary and elliptical positions! 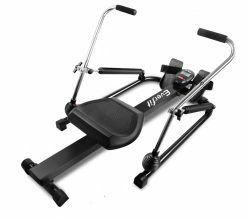 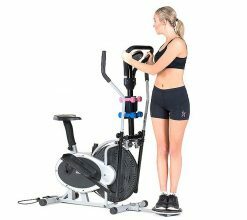 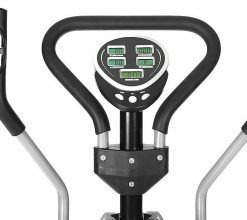 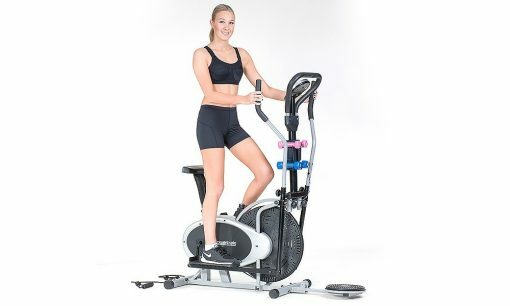 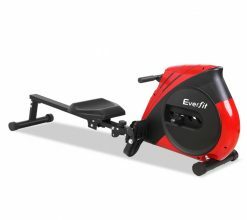 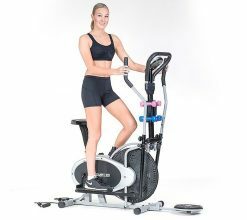 Reversible movement: This elliptical bike features a fully reversible movement which allows you to target a whole new muscle group as you push backward. 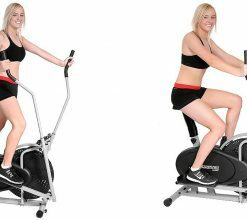 Tone your legs like no other machine on the market! 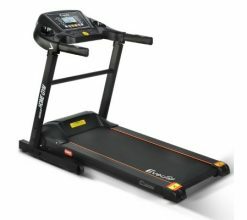 Computer functions: Push your personal best using the on-board computer which displays duration in time, speed, distance, heart rate and even a rough guide on calories burned. 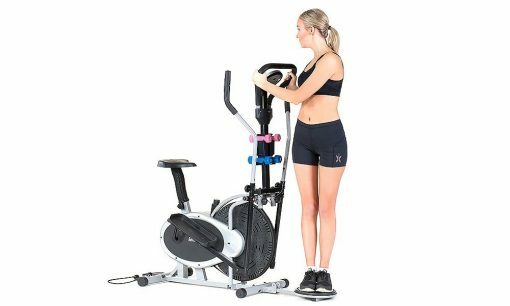 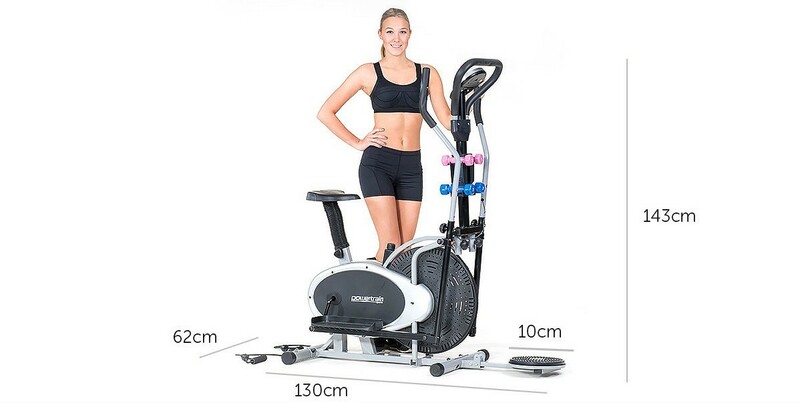 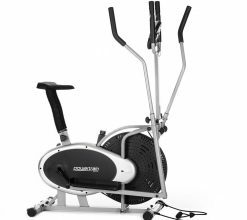 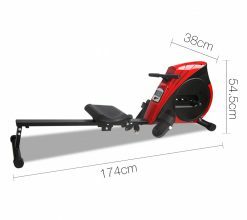 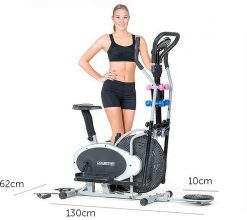 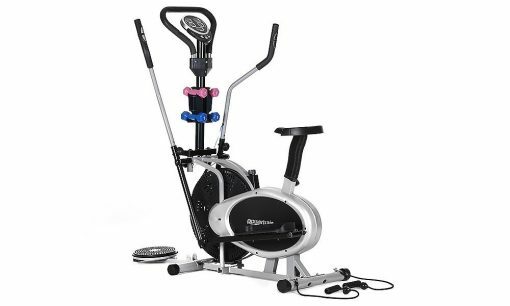 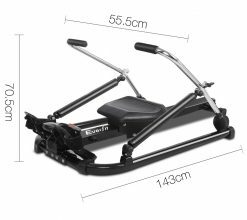 Weight Twist Disc: Cross trainer bike also features a weight twist disc attachment which is perfect for improving muscle tone, circulation, flexibility an d mobility. 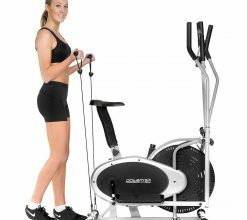 Twist your way to slimmer abdominal , glutes and quadriceps. 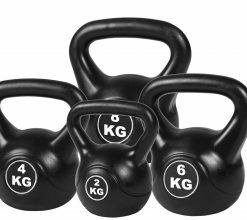 Dumbbell Set: Your purchase includes two dumbbell sets (2lbs and 3lbs) made of iron and coated with vinyl coating for maximum comfort and grip. 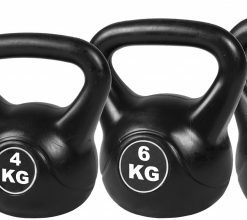 Training with dumbbells can help you achieve your fitness goals more effectively. 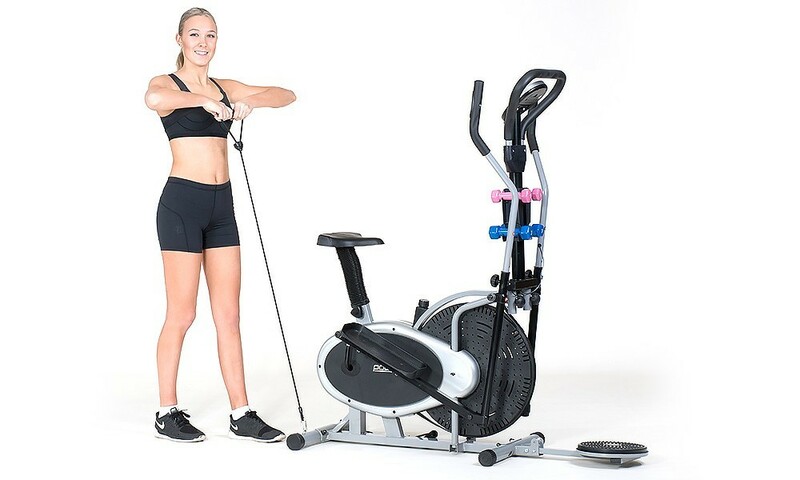 Resistance Bands: It also features resistance band attachments, which enables to greatly enhance range of exercises that can be performed during single workout routine. 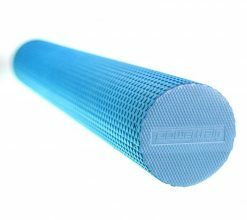 Yoga Band: These resistance loops are ideal for yoga and pilates fitness, toning and strength training in classes or at home. 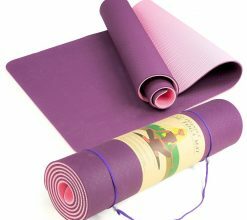 We will dispatch random coloured resistance bands.